Hello again. The new web site is almost here! Also in this newsletter we have the second half of the heater tap vacuum system and news of the up coming MBCV Concours. You will have to travel to Melbourne this weekend to buy the Special of the week! This weekend is the Mercedes-Benz Club of Victoria Concours. The Concours is being held in conjunction with the with the AOMC British & European Motor Show at the Dandenong Show Grounds on Sunday the 30th of March. There is also a dinner on the Friday and Saturday night. Bookings were required in advance for the dinners (I am not sure if you can still get in), but anybody can turn up to the Concours. If you want to you can download an information pack here. More details of this event and other MBCV events can be found here. Hopefully you guys all noticed the strange URL for this newsletter!! We are very close to launching the new web site. It is still a beta version, but is now in the final stages. If you click here, you will get to see the new front page. It is designed to be a page that can be used as your homepage. It will have up to date information of our cars and specials as well as interesting info like the news headlines, time in Canberra and a link to Goggle (haven't done that yet). We are planning to change some aspects of the front page every few days so you should be able to see something different each time you view it. Don't bookmark the link just yet it is still a beta site....! Please don't try to buy anything from the shop as we are still setting it up. However the big news is that you can now log on as a member and get your own password. You will need this if you want to continue to get the newsletter. To do this simply click onto the red Newsletter button on the right hand side and follow the link to the subscribe page. You can also nominate what model you own so we can inform you of any specials we have that are specific to your car. Or if you are interested in buying a specific model you can also nominate that. First of all, let me explain how the vacuum switches, that are in the console and are operated by the heat control levers, work. Remember the red vacuum line that winds its way around and holds the heater tap closed? When you operate the heat control lever you create a "controlled vacuum leak" that means the vacuum supply to the heater tap drops. As a result the tap opens and the heater core gets hot. (presuming the engine is at operating temperature and the thermostat has opened). This operation happens in the first 1cm of travel of the heat control lever. If you operate it gently you can feel the switch opening. The next 7-8cms of travel on the heat control lever is controlling a flap that regulates the amount of air that can flow through the heater core. Don't be fooled into thinking that the amount of air flowing over the heater core is controlled by the fan speed. The second most common fault with this system is that the flaps that control the heater core air flow jam in the full open position. S o once again, when something goes wrong, the heater is jammed on, not off. What causes the flaps to jam is that over a period of time they have warped and no longer fit in the hole! There is a simple solution to this using a piece of foam to support them, but it is 6 hours labour to insert the bit of foam! know because I have done lots of these over the years. When the flaps jam in the open position, the heater tap is also jammed open, as you can not push the heat control lever all the way to the bottom. If you remove the trim under the dash (both sides) you can see the levers that control the vacuum tap and the flaps. There is a 10mm nut that connects a rod to a lever (sorry that's the best description I can come up with). In an emergency you can loosen this screw which will allow you to push the heat control lever to the bottom and shut the heater tap. However this is a short term solution. Even when the heater tap is in the closed position it allows a small amount of coolant to pass though. The idea of this is that over summer when the heater is never on there is enough flow to stop it from blocking up. In theory there should be no air passing through the heater core so the fact that it has a small amount of hot coolant in it does not matter. But when the flaps are jammed open you can still get some hot air even with the tap turned off! No new cars this week. Heard of plenty, but the owners all wanted too much money for them!!! Another few quite weeks on the car front! The first six weeks of this year were the best on record and then it slowed right down? We are not worried however, as we have seen trends like this before. One month you sell nothing and then the whole lot sell in two weeks!!! The only cars to sell since the last newsletter were the white 230E and the lovely 1995 E280 sedan. 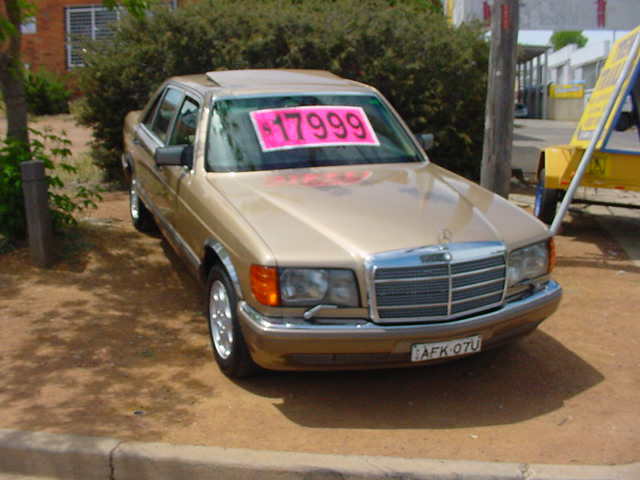 We traded a nice 82 model 280Se sedan on E280, 268000kms silver with blue tex. Everything works and it is in rather good condition for the age and mileage. I have been driving the 1983 280SE this last week and it really is a nice car. These must have been a great car when compared to all the others on the market back in the early 80's.